The DoubleSplash was the rage of the 80’s and 90’s. Everyone “art-ing” in major comics wanted to have at least one book where they could drive their fingers into nubs drawing mega-images of the character they loved to draw. Some would have whole books with nothing but splash, DoubleSplash or even a triple gatefold. I was one of those guys where DoubleSplash would be as far as I can go. Because I knew ME. LORD KNOWS that I would try to fill as much of those pages as possible and although you can LOVE to draw, there’s a sense of anxiety in accomplishing it. Sometimes, unless you really have something to prove, you just want it to be over. But the art of the doublesplash is purely to create a mimicked experience of a broader wide-angle shot of cinematic proportions. And I’m a storytelling kind of guy. It’s a great tool. Which means whatever it takes to tell the story, i’ll accomplish it. I stopped doing pinup style splash/DoubleSplash a long time ago. And because of that, I have to think more. And draw more. 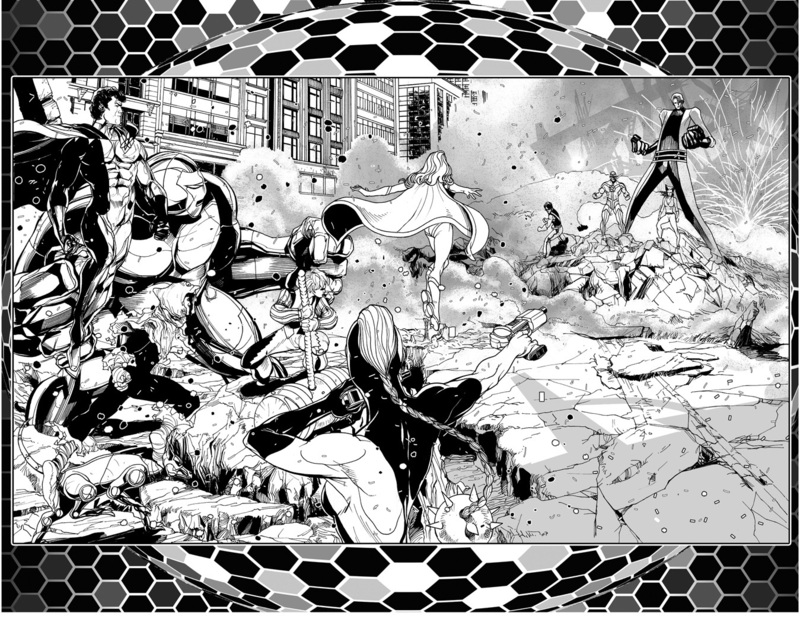 This particular DoubleSplash came from the second installment of my 2 issue run on DC Convergence: JLA Detroit. This opportunity to finally get to draw these characters fulfilled a notch on the wish list for me. And that was a “What If?” What if I drew in the ’80’s with what I knew now? And these two books were an answer to all that. This here is the snapshot of a scene about to explode. Where I come from, they call it “things about to break off in here”. And it’s a classic tension in comics and animation/cinema. So many things can go wrong opening it up to this scale, and if you’re a person who loves a challenge, you salivate. The Justice League of Detroit vs. The Heroes of the Tangent Universe. This took awhile, but I dug my teeth into it. Believe it or not, composition is the thing that took the longest on this piece. I needed this to be as close to my mind’s eye as possible. And you have to know how hard that is. It’s the bane of an artist’s existence. I must have redone the concept of the page(s) 5 times before jumping in on it. It was taking FOREVER. THE PROCESS can be unforgiving. This is pages 2 and 3 without the color of the amazing SNAKEBITE.